I really like the movie "A League of Their Own." Brilliantly cast, written and acted, I still enjoy seeing it 18 years after its release. 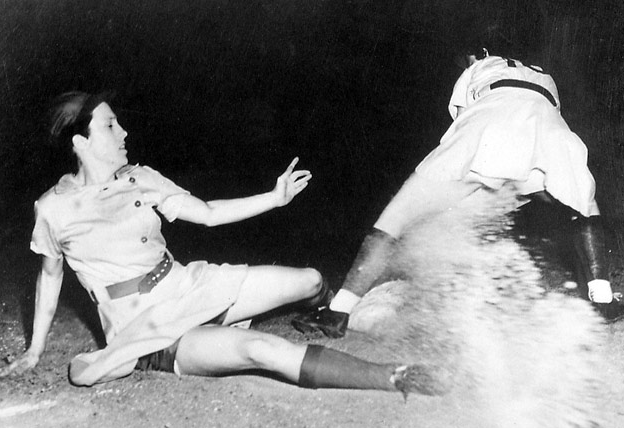 I didn't know that Dotti Hinson (the Gina Davis character) was modeled after Dottie Kamenshek, the star player of the All American Girls Professional Baseball League. Kamenshek passed away last week. She was so good that a minor league mens' team tried to purchase her contract. Here is the kicker: Unlike most star athletes who are one-dimensional, Kamenshek was anything but. Time magazine picks up the amazing story: Kamenshek retired in 1953, just a year before the league folded. She went on to graduate from Marquette University, practice physical therapy, and become chief of the Los Angeles Crippled Children's Services Department. UPDATE: It is playing today on Encore West at 2:30pm Central and Monday at 8:25am and 3:15pm on Starz.